Our hotel near Pebble Beach boasts a variety of services and amenities, ensuring every stay at the Portola Hotel & Spa a memorable one. With a friendly staff, picturesque views, and stunning accommodations, the Portola Hotel & Spa perfects the Monterey Bay experience. The 379 guest rooms and suites boast luxuriously soft feather top beds, plush triple-sheet bed linens, and more for the ultimate comfort during your stay. Surf the ‘net with our high-speed Internet access, or catch a movie with our top-run on-demand movie selection. Other amenities include eco-friendly bath amenities, hair dryer, same day laundry and dry cleaning, in-room Keurig® coffee and tea, and more. Read more about accommodations at our hotel near Pebble Beach. Portola Hotel & Spa is located in the heart of downtown Monterey, just steps away from historic Fisherman’s Wharf and the Monterey Bay. Tour the wonder of the sea at the Monterey Bay Aquarium or National Marine Sanctuary, explore 17-Mile Drive, Big Sur, Carmel-By-The-Sea, Pebble Beach and more. Enjoy endless shopping, dining, and more just minutes from one of the finest Monterey, California hotels. Read more about nearby attractions. With plenty of options for on-site and nearby dining at the Portola Hotel & Spa, you’re sure to never go hungry. The Club Room, located just steps from Fisherman’s Wharf, serves a daily European style breakfast buffet with sustainable, local ingredients. Jacks Monterey located inside the hotel lower lobby offers California Cultural Cuisine from locally sourced ingredients, an award wining wine list and much more. Peter B’s Brewpub is the perfect place to gather with friends over a pint or two, boasting Monterey’s original craft brewery and great pub food in a warm, friendly atmosphere. The Portola Hotel also offers fresh baked pastries, house made sandwiches, and coffee at Peet's Coffee located off the hotel lobby. Read more about dining at Portola Hotel & Spa. The Portola Hotel & Spa is a full-service hotel in Monterey, CA, offering balconies, patios with cabanas, high-speed wireless or wired Internet access and eco-friendly amenities. At the Portola Hotel & Spa, we ensure your comfort during your stay and Monterey, CA lodging. Read more about our guest room amenities at Portola Hotel & Spa. Portola Hotel & Spa offers over 60,000 square feet of meeting space with the adjacent Monterey Conference Center. From board meetings to weddings to galas and other gatherings, our experienced catering, convention services and on site event technology staff will professionally handle all the details of your meeting or special event. Read more about events and meetings at the standard among hotels in Monterey, CA. 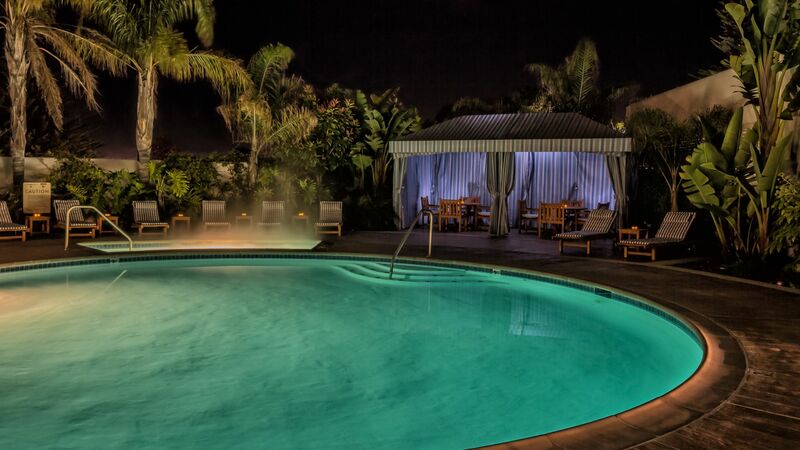 Revitalize your mind and body at the largest day spa in Monterey County complete with outdoor pool and Jacuzzi. Spa on the Plaza boast separate men’s and ladies’ locker rooms, relaxation lounge, and salon with pampering pedicures and manicures. With 10 treatments and an extensive spa menu, relaxation is just minutes away at the Portola Hotel & Spa. Read more about Spa on the Plaza.